Introduction: Obturator hernias are rare, comprising less than 0.1% of all hernias and occurring in approximately 0.4% of bowel obstructions. Typically these hernias affect elderly, frail, debilitated women; 85% of patients are female with mean age of 82 years and mean weight of 34.5 kg. Only 1 of 10 cases is correctly diagnosed preoperatively. The diagnosis of this rare hernia is made moredifficult as symptoms are vague and physical examination is often inconclusive. More than 90% of patients with obturator hernia present with intestinal obstruction and the mortality rate is reported as high as 13-40%. Thus, early recognition and surgical repair of obturator hernias is important for practicing surgeons in the academic and community setting. Case summary: An 85 year old female presented with a five day history of abdominal discomfort, anorexia, and obstipation. The patient had no prior abdominal surgeries. On physical examination she was a thin (100 lb), dehydrated, elderly woman. Her abdomen was distended, diffusely tender, and tympanitic. Labs revealed an elevated hematocrit of 40 and a BUN of 40 confirming dehydration. The WBC count was normal. 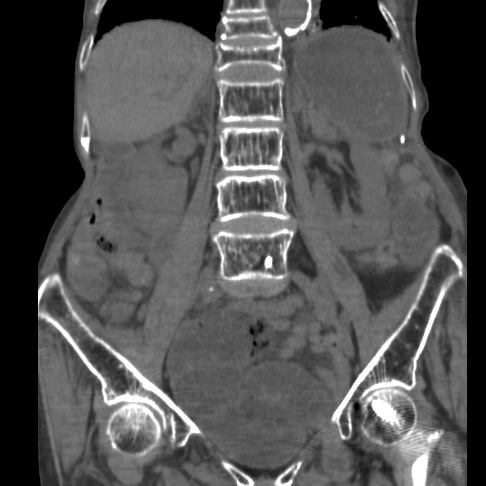 The abdominal CT scan was accurately interpreted and revealed an obstructing left obturator hernia. The coronal view was classic with a transitional zone at the obturator foramen (Figure 1 and 2). The patient was resuscitated and we proceeded with diagnostic laparoscopy. A segment of small bowel was found to be strangulated in the left obturator foramen (Figure 3). With gentle traction the herniated small bowel was successfully reduced (Figure 4). 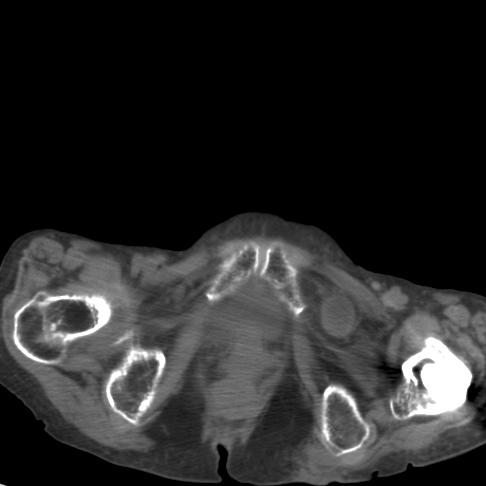 The knuckle of small bowel was necrotic. It was held with a grasper and exteriorized through a small suprapubic midline incision. It was resected and primary anastomosis performed. The abdominal incision was closed and attention was re-directed to the hernial orifice. Laparoscopic repair was performed by closing the defect with 3 interrupted Prolene sutures (Figure 5). A small space was left superiorly to avoid injury to the obturator nerve and vessels. Mesh was not placed to avoid infection due to the strangulated bowel. Post-operative recovery was uneventful and she was discharged on day 5 on a regular diet. Conclusions: Laparascopic repair of strangulated obturator hernias is feasible and can be performed with minimal morbidity. CT scan facilitated an accurate diagnosis and laparascopy provided excellent visibility in the deep pelvis. Abdominal contamination was minimized by isolation of the necrotic bowel and extracorporeal resection of the dilated bowel. This approach may minimize morbidity by reducing incisional pain, lowering infection rates, encouraging early ambulation and decreasing length of stay. 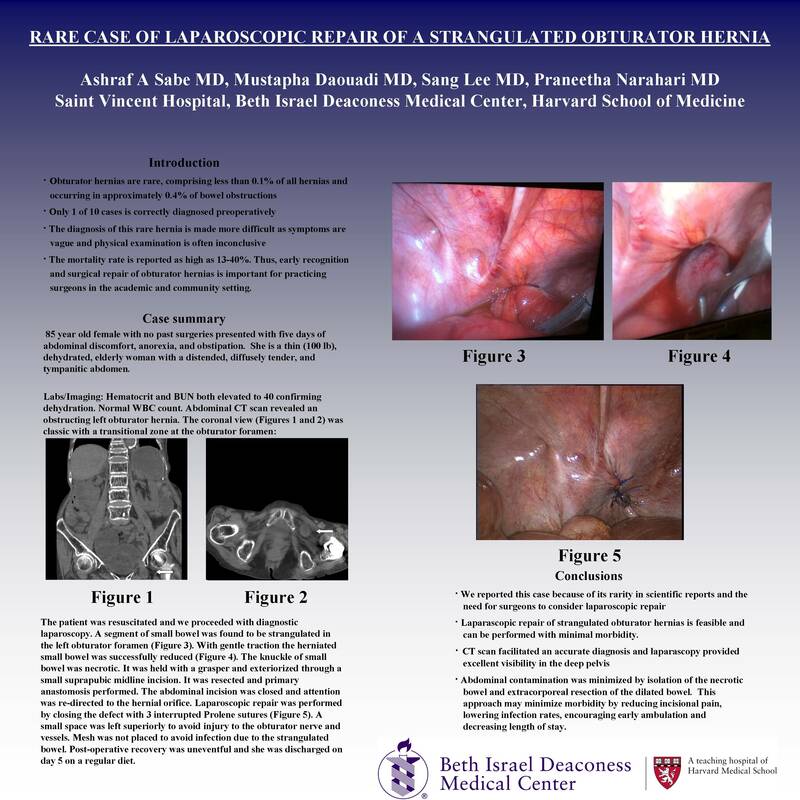 We reported this case because of its rarity in scientific reports and the need for surgeons to consider laparoscopic repair in the management of this rare but potentially devastating disease.